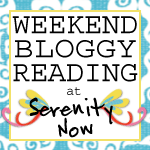 Before I offer you some fabulous Weekend Bloggy Reading links, I wanted to welcome all the new Followers who signed on this week. I am so glad you're here! I also wanted to say a BIG thank you to every single one of you who linked up to the very first Dishing It! party. It turned out to be a much larger party than I was expecting. That's awesome, but what I truly hope is that you all took to heart my intentions for any party I host. A party is not a party unless the guests are networking and getting to know one another. Please make every effort to return comments that were left for you during my Dishing It! party. Take a few days if you need to, but please be mindful of blogging etiquette...it's just plain nice to return a visit to your blog if you can. If you joined the party late on Thursday, you may want to do a bit of visiting if you haven't received any comments yet. People might not have seen your link yet! To show that I meant it when I said I valued relationships in blogging, and I appreciate bloggers who take the time to really participate in parties, I planned my own little surprise Giveaway. I went through every single link on my list, leaving a comment, but also looking to see who was doing the most visiting. Ironically, Jen from Tatertots and Jello had a comment on many of the blog posts (I truly lost count after awhile), and she definitely doesn't need any return traffic with a blog as huge as hers! What I appreciate about Jen is that even though she has a very popular blog, she takes the time to get to know her readers. So, Jen, I have a little Spring "thank you" surprise for you. Now, on to the big fun! Here are some super-fun links I found this week when I wasn't Dishing It! with you guys. ~Check out Stacey's wonderful Before and After photos in her Guest Bedroom Makeover. ~Paula blogs about the Progress on the Walnut Avenue Remodel she's made with her mom over at Sweet Pea. ~Kelli's Applique Beach Towels...start now to be finished in time for pool weather. ~Cheryl had a fabulous post on How to Make a Ruffle. Excellent for sewing rookies like myself! So, did you enjoy partying with me this week? Haven't had enough? 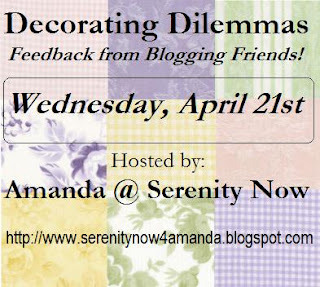 Even though my (big, gulp) birthday is coming up next Wednesday, I'll be hosting the next session of Decorating Dilemmas! 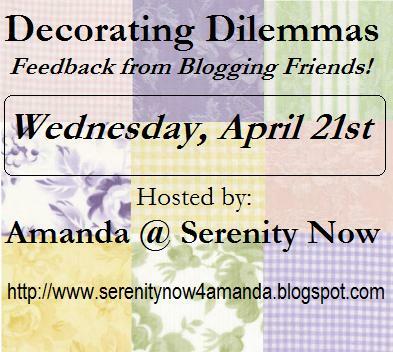 This is another blog party designed with the idea of bloggers encouraging one another and offering helpful feedback. 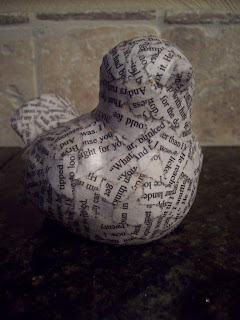 You can link up a Dilemma OR a Solution...anything in or around your home that is decorating related! You can click here to see how the last Decorating Dilemmas party worked. Please link up on the 21st so my birthday won't be a downer, 'kay? We have a MOPS playdate at a local indoor play park this morning. This means we will need to bathe in Purell when we get home. Good times. Pizza party and dessert with my brother and favorite (for realz, SuSu!) sister-in-law tonight. She wants some help burning a CD for my totally RAD 80s themed birthday party next weekend. Hoping I can trick convince T to take me to see Date Night on Saturday...that would be fun, right? Don't forget that there's still time to enter the simply adorable Cutie Pants Giveaway! I didn't get to enter but I did visit some new blogs, it was a great idea ! I'm so glad your linky party was a success! Isn't Jen the best too:) Thanks so much for featuring my towels! Thanks again for hosting the party! It was so much fun, I can't wait for tomorrow when I have time to go visit more blogs! Thanks so much for hosting this party. As a blogging newbie, it was a kick and a half to have the extra traffic to my blog, and read all the lovely comments. May I say your site is lovely, like a present wrapped in designer paper. I first visited your site because of your title, as I'm a huge Seinfeld fan too. Glad the party was a success!! And even larger than you figured!! Woot!! That is super! You are the best, Best, BEST hostess. No wonder your party was such a success! Hope your weekend is wonderful. Don't forget to close your eyes when you bathe in Purell. That stuff hurts if it gets into your peepers! I love your blog and am giving you an award. 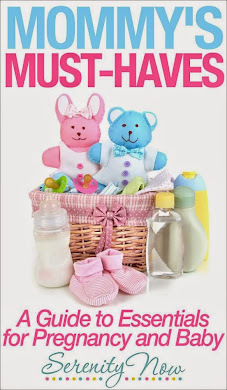 Come on over to my blog to check it out. You are so sweet! I must have missed your first email. I love parties like yours because it gives me a chance to meet new people, and that's the reason I blog. You are the sweetest and the best commenter. I love reading yours because they are so sincere and thoughtful! Thanks for hosting it Amanda! It was a great way to find blogs that I wouldn't otherwise have! Have great weekend! Amanda it sounds like your party was great! I am sorry I didn't get to link up to it...I will for the next one. :) You have always been so great on making other blogs feel love and commenting. You are so thoughtful and caring...that is what I love about you! I thank you for your friendship since I have known you in this bloggy world. :) I didn't realize we have our birthdays so close together...mine is the 20th...no wonder we get along so good, great minds think alike! Your party was a big success! I'm still making my way through the list. Thanks for featuring Mama's house this week. The next update hopefully will be a big one that shows a lot of cosmetic changes that make a big difference like paint. Enjoy your weekend and I hope you get to go to the movies with T.
Thanks so much for hosting the Dishing It party! I enjoyed participating as well as visiting other blogs and meeting new people! I'm following your blog now and I can't wait to see more of your ideas! Thanks so much for linking up to my Guest Room makeover! :) So sweet of you! Hope you have a fun weekend, sounds like you have a lot of great stuff planned! Hubby & I are getting the kids watched for free tonight at our church (ya-hoooo!!) so we're having a date night tonight, then a work day on the house tomm! Enjoy your weekend! Hello friend! You are such a fabulous hostess! I LOVE Jen, she is so sweet and sincere. I can't believe it's your birthday again...we have really known each other for awhile now! What a sweet idea to give a gift to one of your most active participants. Love that.